Panel and Notifier for Instagram™ is an easy way to browse your Instagram wall from a toolbar popup, plus, get badge notifications for new posts. 1. A complete Instagram page right in your browser toolbar. 2. Notifies you every time a new item(s) is posted to your wall. 3. Badge-icon text shows you the number of recent items. 4. You can adjust the badge number based on the new post's time-frame (see options page for more details). 5. Popup width and height are adjustable to your choice (in options page). Note 1: Panel and Notifier for Instagram™ does NOT belong or relate to the official Instagram application at all. It is basically an unofficial extension that is developed and maintained independently. The official Instagram software is only released for smart phones and the web. 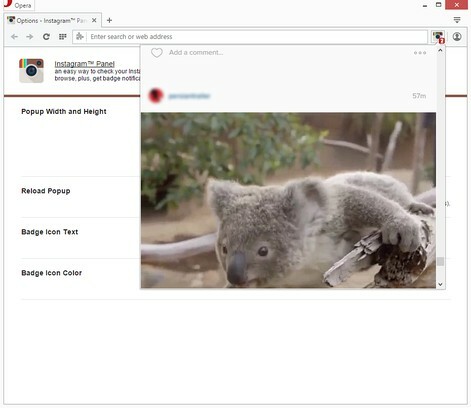 This unofficial extension is a wrapper to the original Instagram and tries to make it usable as a browser extension. Note 2: before using the addon, please make sure you are logged-in to your Instagram account. Note 3: in order to report Bugs, please visit addon's homepage (http://mybrowseraddon.com/instagram-panel.html) and fill the bug report form.